Amrit Khurana may have little to say in person, but she speaks through her paintings with unbridled clarity. 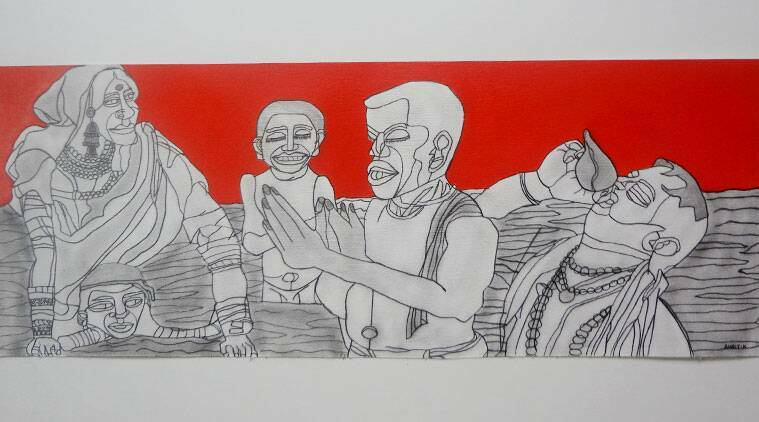 Amrit Khurana’s art is her communication with the world, her understanding of her chaotic surroundings. The ‘Women of Substance’, taking selfies with their pouts and V symbols, take you aback for a second. Placed right next to the men in their suits and corporate jobs, the businessmen, I immediately wondered at this contemporary representation of the two genders – much too similar to what traditional gender roles prescribe. Only the next instant, however, I realised that it may be a result of the limited world-view that Amrit Khurana was offered in newspapers and multimedia. For her, perspective is difficult to communicate but once she gets it, it won’t be difficult for it appear on the canvas. It will not be easy to engage her in conversation because she likes to be reserved, keeps to herself and will not approach you upfront. But the way to her deepest thoughts is through her etchings on paper. 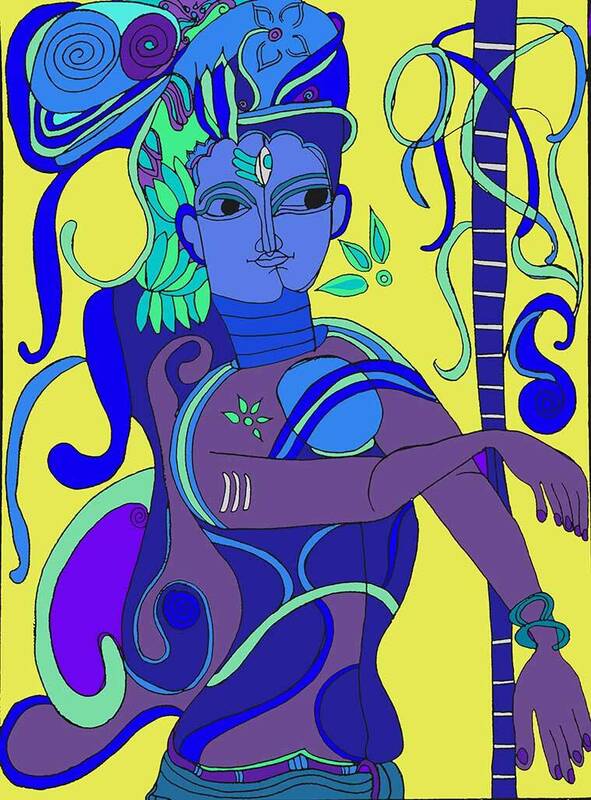 You get a glimpse of it in Khurana’s solo exhibit Kaleidoscope, which was on from July 2 to July 5 at the Alliance Francaise de Delhi gallery. Amrit started her journey with art at the tender age of 8, when her day-to-day drawings was recognised by her teacher at the Selaqui World School in Dehradun. But before that, Amrit and her family faced a greater problem – she was differently abled because of her autism. But only the expression of the artist matters when it comes to art. Amrit’s art became her identity. I first knew her a very long time ago, too young to know or understand her talent or her ability, but meeting her after all these years at her first art exhibition completely changed how I saw the 23-year-old. She was no longer that girl I knew. She was a known name, her identity a long way ahead of what many people summed her up to be. Drawing scenes from daily life, including the minutest details of the every day, Amrit’s parents soon discovered those sketches were a result of her eidetic memory (when someone vividly remembers things as if they can see it). Doon, as Dehradun is often fondly called, being the beautiful valley that it is, prompted her to draw the landscapes around her, the animals she saw on the road, the various everyday events she observed. When she moved to Noida, however, these landscapes were replaced by tall buildings and cityscapes. Her first exhibition was a mix of these two themes, converging into abstract, coupled with her own recreation of people she saw around her in newspapers, on the TV, ranging from politicians and cricketers to people walking on the road. Covering the entire canvas, she drew resilient lines, ones that would go everywhere on the canvas. Sometimes, they would resemble a face, depicting no particular theme or order, but mostly a reflection of chaos. The colours, however, always remained surreal, flitting from one palette to another, jarring and yet fitting together perfectly. Her next show, also her first solo show, brought out a range of differences from the previous one. While the painting still completely filled the canvas, the chaos became more efficient in communicating itself, figures and faces merged into each other. However, in her recent solo show, Amrit’s art emerged fresh, with a new perspective and with her old but now perfected lines. Her paintings came out more layered, each with a thematic clarity visible to the audience. While the lines are still wayward – a characteristic of her fingers, her very defining point – each wayward line now has a distinct end. There is a conclusion to the painting itself, but there are no limits to its interpretations. The intricate detailing in every painting is also what catches your attention. Sample ‘Goldsmith’s Queens’ – the posture of the women and their jewels make a distinct appearance, capturing your imagination. Through the representation of the mannerisms of the people in the painting, Amrit manages to bring out even the mood of that moment in time characteristically. Her art is important because it is her communication with the world, her understanding of her chaotic surroundings and what she makes of it. With little to say in person, Amrit speaks through her paintings with unbridled clarity. This aspect also emerges better with each of her exhibition, as she herself grew to understand the importance of her work. With that, she has also started to put her paintings on ceramics and clay pots. It is difficult to gauge what goes in Amrit’s mind when she paints, even for her mother. “Earlier, her art knew no boundaries. She used to keep drawing until she wanted, but now she has a better understanding of when she has to stop, that there is a definite end to the process of painting one painting,” says Aarti Khurana, who has been the most instrumental in bringing Amrit’s artistic journey to life. Amrit has also changed how she wants to present her paintings. While she never wanted to have similar paintings in one frame, that slowly changed when she recognised the importance of bringing two or three paintings together, under a common theme. Of course, the placement is always her choice. “It is her decision. We suggest something else that might look better to us aesthetically but she will hear none of it. She is very clear with what she wants,” Aarti says with a smile. The clarity may not be visible to the outsider but Amrit knows, even if she doesn’t say it. The world may not be able to relate to her but she has put forth her perception of her milieu out there, for everyone to see and observe and, maybe, understand her better.